There’s been a lot of buzz at recent conferences around a controversial new paper in J. Neurosci. from Ray and Maunsell on LFP traveling waves. It’s a pretty direct, and rather convincing rebuttal of an influential Nature Neuroscience paper by Nauhaus et al. published a couple of years ago. Nauhaus found what seemed like pretty convincing evidence that spikes trigger traveling waves of activity visible in LFPs; that these waves travel through lateral connections; and because the dynamics of these waves change during stimulation compared to spontaneous activity, that stimulation modulates functional connectivity. These are exciting findings that will surely trigger more research now that everybody is jumping ship from single-cell electrophysiology to large scale recordings. It implies among other things that a single spike matters; it isn’t lost in a sea of spiking activity, but rather triggers secondary activity that is amplified in the network. To reach these conclusions, Nauhaus et al. they recorded from visual cortex with a Utah array (a square array of 96 electrodes spaced 400 microns apart) in two different species. They computed the average of local field potentials occuring around the time of the spikes of a reference electrode during spontaneous activity. This gives plots of spike-triggered LFPs as a function of location on the array like the one shown above. You can clearly see that the size of the peak of the spike-triggered LFPs diminishes as you move away from the reference electrode. 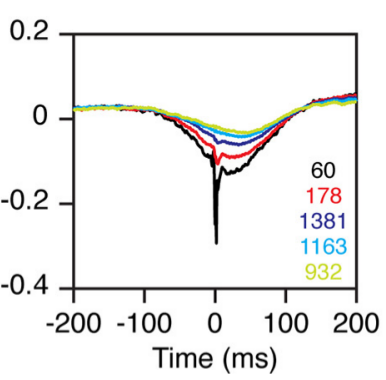 In addition, they found that the peak of the spike-triggered LFPs occurred later and later as a function of distance (barely visible on these plots). The speed of the displacement of the peak is consistent with the known dynamics of lateral connections. 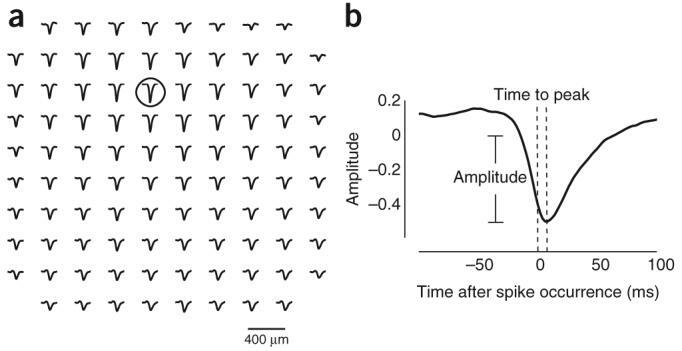 Together, these findings argue convincingly that spikes trigger traveling waves of activity spreading through lateral connections which are visible through spike-triggered LFPs. The authors then compared the spread of these traveling waves during spontaneous activity and during visual stimulation. They found that the spike-triggered LFP peak decreased in amplitude faster as a function of position in the stimulation condition, as shown above. 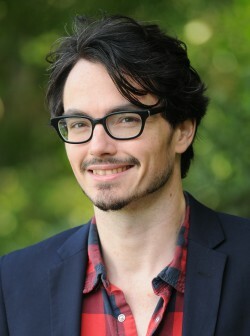 Thus, they concluded that the functional, or effective lateral connectivity of neurons is stimulus dependent. The hard data is pretty unambiguous, but is this the correct way of interpreting the data? One issue is that the spike-triggered LFPs have a large non-causal component (see the activity before time 0 in the right panel above). This indicates that a spike happening on one electrode is correlated with activity in another electrode in the past, which argues against the idea that the first is causing the second. The authors argue that this is due to a combination of factors, among them signal processing artifacts (when LFPs are acquired, they are low-pass filtered). If in fact the non-causal component cannot be explained away by signal processing, this argues against the traveling wave hypothesis, and for common input effects. The authors do mention that the non-causal component could be due to a common input effect. Indeed, one recurring problem in working with spikes and LFPs is that everything is correlated with everything, so teasing apart cause and effect is tricky and typically strongly dependent on assumptions. Spikes are known to phase-lock against certain LFP bands, and as a population, they tend to lock around the same phases. Furthermore, LFPs are heavily correlated across space. If one spike occurs on an electrode, that means that the LFP on that electrode is more likely at a certain phase; but since LFPs on proximal electrodes are at similar phases, spikes on those electrodes are likely to occur around that time. This will be visible in spike-triggered LFPs, and could explain the non-causal component of the response. 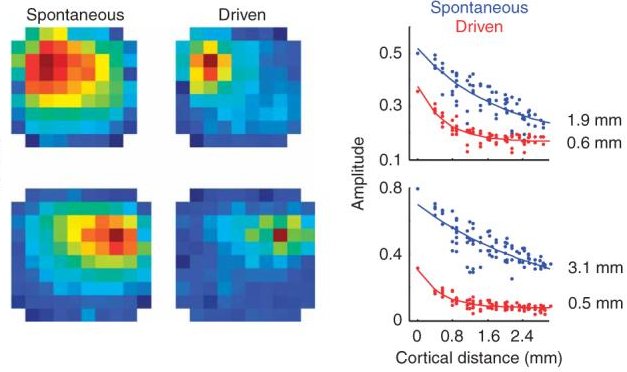 Phase locking can also explain the apparent modulation of functional connectivity during stimulation compared to spontaneous activity. Stimulation increases the strength of high-frequency components in LFPs. If these high-frequency components are similar to spikes (and they are according to another Maunsell paper), then a hand-waving argument says that the characteristic spatial correlation of high-frequency LFPs should be about the size of a cortical column. This is quite a bit less than the spatial correlation of low-frequency LFPs, and so with stimulation the spatial coherence of the apparent traveling waves should decrease. So phase locking could explain the non-causal component of the apparent traveling waves, and it can also explain the modulation in spatial spread of the waves with stimulation. There is one fact that is hard to reconcile with a phase locking explanation, and that is the apparent propagation of the LFP waves. As we get away from the reference electrode, the peak in activity occurs later and later (shown above), which is really hard to reconcile with a common input explanation. Ray and Maunsell attack this finding head on. Ray and Maunsell suggest that the apparent shift in the peak is a signal processing artifact. As I’ve mentioned before, the spike-triggered LFP accumulates a lot of garbage. When triggering on the same electrode, there are two negative peaks in the spike-triggered wideband signal (see below). One is very fast and high amplitude (the spike), and corresponds to the mean spike waveform; it’s an artifact. The real component is sluggish and has smaller amplitude (the slab). Now if we low-pass filter these two components only one peak remains, and the position of this peak depends on the relative size and position of the spike and slab. So if the spike is very large, the smoothed peak will be close to the time of the spike; if it’s small, then the smoothed peak will be closer to the time of the slab. Now if we compute the average LFP triggered on a different electrode, the spike component is smaller. If the spike peak is a reflection of LFP phase-locking effects, then it will decrease in amplitude with interelectrode distance. So as we go further away from the reference electrode, the smoothed peak shifts towards the slab. The spike peak occurs at around 0 ms lag; if the slab peak occurs later, this will lead to an apparent increase in the latency of the smoothed peak of the spike-triggered LFP with electrode distance. This will masquerade as a traveling wave. Ray and Maunsell show that all the conditions are met for this apparently unlikely scenario to occur. Cells prefer an LFP phase such that the peak of the slab occurs at greater than 0 latency. The size of the spike peak decreases with distance. Furthermore it’s large enough to cause an apparent latency shift in the peak of the spike-triggered LFP. Coincidentally, the apparent propagation speed caused by this artifact is exactly within the range of the velocity expected from activity spread through lateral connections. I don’t think this disproves all of the findings in the Nauhaus paper. It does make a big enough dent in it though that the idea that spikes generate traveling waves of activity through lateral connections visible in LFPs should be considered unproved, IMHO. It does remind us that it’s important to keep in mind signal processing concerns when dealing with LFPs. If Ray & Maunsell are right, this never would’ve happened if using the raw wideband signal rather than the output of the LFP board. Thanks, Patrick. I had a really productive morning reading this!